Jawanan is a Redguard fletcher. 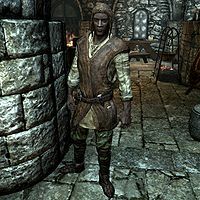 He will only appear as the vendor in the Fletcher shop in Solitude if Fihada, the original owner, dies. Jawanan wears a set of farm clothes, a pair of boots, and a hat. He is equipped with an iron dagger, and carries a key to the store, as well as a selection of common loot and gold. He will greet you by saying, "Ah, yet another new face. I'm from Hammerfell, you see. I can hardly keep track of all the people I've been meeting." or "Always good to see a fellow traveler. I hope you've found the roads relatively safe. Free from dragons, at the very least..." At other times he will talk about his work: "Fletching suits me. It's difficult, and sometimes tedious. But a well made arrow strikes forth like the fury of a god." or "If you're looking for any archery or fletching supplies, you should see Fihada. I'm just the apprentice." Should you bid farewell to him, he will say, "Stop back anytime." or "Good to talk to a fellow traveler." Telling him that he's a long way from home, then, will have him reply, "Aye, but I'll be here in Solitude for longer still. Fihada's skill as a fletcher drew me to this place. I wanted to learn. And there is still much of Skyrim I wish to see. I hear there is a city, Wind-Helm, that is nearly white with... What do you call it? Ah yes! Snow. And far to the west lies a ruin. Volskygge. Inside, there is said to be a wall, black as night. And it speaks! In the ancient Dragon tongue! There are wonders in this place I never dreamed imaginable." When asked if he's ever been to Helgen, he'll respond, "Where the Dragon attacked? We've heard rumors of death and... and fire from the skies. But no real news." Say that the rumors were all true and he'll tell you, "Then we should soon be selling arrows by the bushel. A sword is no good against a dragon." Fihada: "How's it coming there, Jawanan?" Jawanan: "Slow, but looking good, sir." Fihada: "Slow's the only way to do it! Work too hard and you'll warp the wood." Jawanan: "Fihada, where did you learn how to make bows so well?" Fihada: "The same place I learned my charm and quick wits: I used to be an Imperial ranger, my boy!" Jawanan: "Wish I could learn some of that charm. I'm just good with bows, not people." Fihada: "You'd make a better Imperial ranger than me. I may have charmed the locals, but my fellow soldiers hated my waggling tongue." This page was last modified on 30 May 2014, at 22:39.